Welcome to O&3: welcome to the next generation of oil providers: welcome to our family. We are Jennifer, Eleanor & Thomas Kerfoot. 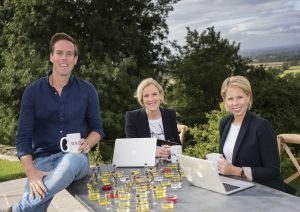 Now if ever there was a name synonymous with oils we’d like to think ours hits that headline; proud we very much are, of our heritage, of our parents – but also excited & energised for this next chapter. We intend to break the mould by moving fast, seeking the impossible, listening not dictating & knowing of those trends before you … a new culture awaits. Immediate product information, knowledgeable customer service, detailed technical certificates & cross-continent coverage we will work with you to ensure our ingredients surpass your expectations each & every time. So here in our Kerfoot diary we will share this journey with you as we dive back in to the magical world of oils. Be it our Mother sharing a tale of days gone by (our other CEO in this story, our Chief Emotional Officer! ), our husband’s blogging about their metro male lifestyle a-la-Yorkshire, Thomas’ wife talking about our oils on her Malibu beach, or how our oils have saved our baby’s bottoms … we are a family who live & breathe oils & cannot wait to share this journey with you. So from our family to yours, welcome to O&3!